eViL pOp TaRt: Oh Speed Trap, Where Is Thy Sting? Speed traps are among the hazards that motorists occasionally encounter: communities that have abrupt changes in speed limits that appear to be without reasonable excuse and are meant primarily as revenue-generators rather than as safety means. 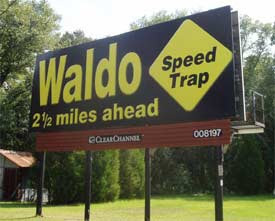 Of course, a speed trap, like beauty, is in the eye of the beholder. Not that the two have other kinds of resemblance. Many states have their notorious speed traps. There is Ludovici, GA, known for having been located on a north-south route that was heavily trafficked. And Hopewell, VA: a small community that generated about $1.8 million per year from traffic fines. It has been referred to as The Million-Dollar Mile by AAA. Stringtown, OK generated 76% of its budget from traffic fines! Some other speed traps to mention are located in Washington, LA, Lawtey, FL, Mound City, IL, and Killen, AL. However, some states, notably Florida and Oklahoma, have enacted state laws that limit the amount of revenue that towns can obtain from traffic fines. Virginia recently passed a law setting a limit of 30% of a town's budget can be generated through traffic fines; hopefully limiting the attraction for having speed traps or at least getting the state in the act. The state would get the excess revenue generated by the speed trap cap into a state literacy fund. So what is likely to occur in places where this would happen? Well, some places might seriously maintain a speed trap for only part of the year, and do it less in other times. In other words, go where the money is! The state getting the amount over the cap can result in the state having a vested interest in the speed trap. So, if the locals don't set one up for part of the year, the State Police might have to fill in the gap. Particularly if the money in excess of the cap goes to something that the state always needs to increase revenues, like education or state employees' payroll! There's more than one way to skin a possum, as they say there. *This paragraph is purely fictional. Speed traps often use tricks to set you up for a ticket, like unexpected speed zone changes. This is part of the problem. This occurs nationwide. It's targeted to catch non-locals. Maybe the speed traps could be set up during the summer vacation times when people are zipping here and there, then take a vacation at Christmas and Thanksgiving time? I hate little towns were the speed goes down to 25....our car just won't go that slow! St. Louis County has 90 municipalities. Some of them are as small as 200 people. But they all have at least one police car. I had hope until I read that * this paragraph is purely fictional. May I quote you? ha! 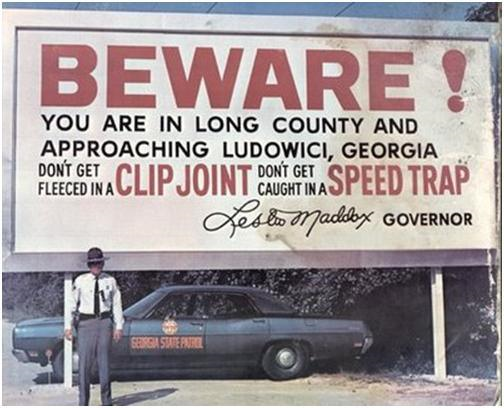 As you come off the Shoals Creek bridge near Killen you go straight into the big speed trap in North Alabama. That damned Killen is a jerkwater town. Ima drive like grandma in strange areas! I was all ready to program Chicken Bristle into my GPS until I got to the asterisk. Bummer! I remember, years ago, seeing Tennessee State Trooper cars tucked in just noticeable places along the interstate. As we drove by we could see that they were empty, but we couldn't count on every one being like that!